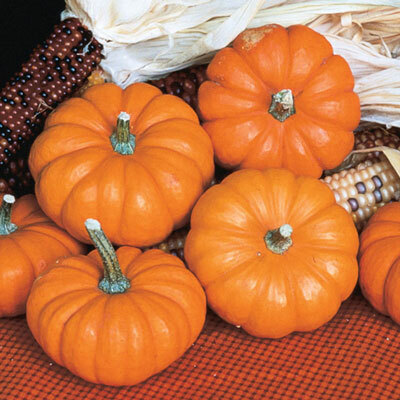 Jack-Be-Little Pumpkin | Henry Field's Seed & Nursery Co. This tiny pumpkin fits into the palm of your hand. Bright orange, smooth fruits are an arts-and-crafter's dream. Fits any garden! Compact vines spread 10-15 ft., producing up to 20 edible fruits. 100 DAYS. Spacing: 5 - 8 feet between hills. Spread: 10 - 15 feet. Days To Maturity: 100 days. Flower Form: Flowers. Female flowers form 1 - 2 weeks after the male flowers. Size: 2 inches x 3 inches. 3 - 4 oz. fruits. Fruit: Deep orange rind with firm flesh . Flattened, deeply ribbed fruits. 2 inches x 3 inches. 3 - 4 oz. fruits. Yield: 8 - 20 fruits per plant.